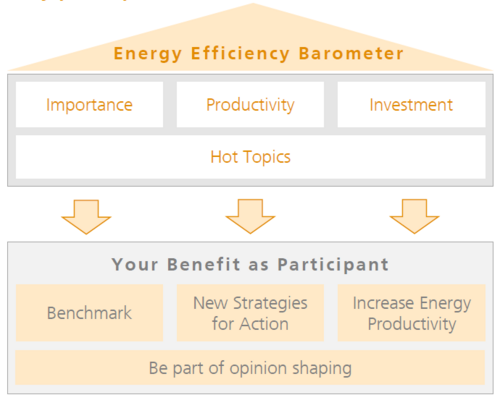 The majority of industrial companies who recently participated in the Barometer, are already pursuing a systematic approach to increase energy efficiency. Furthermore, most of them want to invest in energy efficiency in the future. But where do individual enterprises stand in terms of energy efficiency and what can they do to further strengthen their competitiveness? The Industry Barometer originated in Germany and is collected semi-annually by the Institute for Energy Efficiency in Production (EEP) (ee.uni-stuttgart.de) of the University of Stuttgart, in collaboration with inter alia Fraunhofer IPA, Energy Efficiency in Industrial Processes (EEIP), the Expense Reduction Analysts (ERA) numerous partners across 88 countries. From now until the 30th of September, manufacturing companies across 88 countries once again have the opportunity to participate and help grow the Barometer. Business participation is vital to develop the Barometer and enable companies to consider how they can accelerate the energy transition through greater efficiency and productivity in their own business. In addition to this, through direct comparison with the average competitor in your sector (anonymized), you can make investment decisions and derive strategies for your own business' energy efficiency and productivity. Access to this information can help increase your company's efficiency and thus improve your competitiveness. Results will be published online by the end of fourth quarter. Helps to reduce unknowns, risks and uncertainty in relation to energy efficiency interventions. Informs legislators what the current situation is and what the needs of industry really are, how instruments perform and what type of instrument or framework may be required. Assesses the effectiveness/impact of pilot - and development programs and puts them in relation to control-groups. Makes financial institutions and service providers aware of feasible projects and required funding mechanisms and services. Equips companies and legislators with insights on how and where to act to increase energy productivity. Enables, in medium-term, sector-specific cross-country analyses =>TOP-Runners. Find access to the questionnaire in all languages in eep.uni-stuttgart.de/eeei webpage. The survey takes just a few minutes to complete and your data will be anonymous. Participate and spread the word! In addition to selected results, registered users (free of charge) will be offered an exclusive, sector-specific breakdown of the results. Country and language partners also benefit from sector-specific results (contact author if interested in becoming a partner). Results will be published online in the end of the fourth quarter (2018).